Alcoholism has been made synonymous with Goa, thanks to Bollywood’s numerous projections of the drunken Goan Catholic. There is truth in the matter, according to Sneha Naik, a social worker who works at Hospicio in Margao. She credits the numerous bars scattered at every nook and corner and low liquor prices with accentuating the problem. Though the situation is bad in Goa, the fact remains that this menace exhibits its ugly presence in every society. Stressors like loss of one’s spouse, failed relationships and abuse can act as triggers to edge an individual with an addictive personality towards succumbing to the wiles of alcoholism. Alcoholic women display high risk behaviour like promiscuity. Many who come from a lower economic background take to prostitution to keep up their supply of alcohol. Dr Aldina Gomes speaks of a case where a woman began drinking wine to help her sleep, at the suggestion of a friend. Soon the drinking was out of control and it was only her children’s school teacher’s intervention that averted further complications. If the mother is an alcoholic the negative impact on the children is far greater. It fosters insecurity, lack of confidence and guilt. In many cases the eldest child takes on the parent’s role. Sneha Naik says that there are fewer women than men seeking help to combat their alcoholism. There are women who have taken to alcohol because their husbands drink as well and others who suffer from loneliness and neglect. They are usually between 30 to 70 years of age, and are often brought to the hospital (Hospicio) by well-wishers, in a desperate state. They are mentally unstable, vomit blood, have nerve damage, debilitating general weakness and liver cirrhosis. Patients become suicidal as they suffer from withdrawal symptoms and have to be restrained. ‘Consumption of alcohol cannot be stopped abruptly with these patients. It has to be gradual,’ states Sneha. 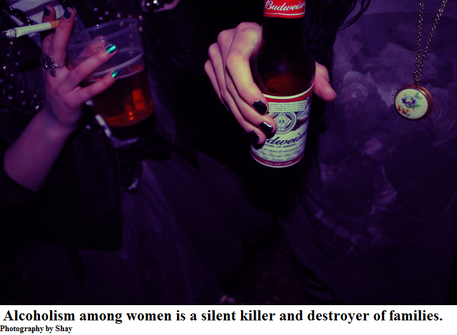 Alcoholic women are more likely than men to suffer from liver disease and brain damage. Other problems faced by women, connected with alcoholism, are increased risk of osteoporosis, premature menopause, infertility, miscarriages, high blood pressure and heart disease. However, medical treatment is most often not the solution. Relapse rates are greater in women, especially if they are from the lower economic strata and from rural areas. Here they have access to cheap alcohol and are unaware of the effects of excessive alcohol consumption. This is where psychological counselling and support groups like Alcoholics Anonymous (A.A.) step in as a saving grace. Attending A.A. meetings breathes motivation to remain sober in every one of its members. Here too, the men outnumber the women. But they are brave souls who have decided to take the proverbial bull by the horns and face their demons. Sharing of stories and bonding as a result of mutual suffering seem to see them through periods of temptation. Alcoholism has been declared a disease by the World Health Organisation and this perhaps makes it easier for those who are held down by this ‘cunning, baffling and powerful’ adversary, to free themselves of the fetters that bind and torment them. The burden of stigma has been lessened to some extent, allowing alcoholics to seek the help they direly need. Eileen first went to a priest, Fr. Joe, to have him pray over her. He took her to Alcoholics Anonymous and her life turned around. Here she learnt that what she had was a disease and every day would be a struggle against it. Then her husband apologised to her when he found out it was a disease and joined A.A. even though he was not an alcoholic. As strange as it may seem to some, she thanks God for her alcoholism because it brought her closer to Him. It has also enabled her to assist others in getting out of alcoholism and come to the understanding that this life is so beautiful. Tragedies have come in the form of the loss of her husband seven years ago and her son one-and-a-half years ago. Nonetheless, being in the programme has allowed her to accept whatever happened and maintain her sobriety for over 20 years now. It is essential the awareness of this disease called alcoholism spread far and wide in Goa. More so, to help those women who still shy away from looking for assistance because of society’s prejudice against them. They need all the support they can obtain to live each day out in sobriety.